The successor to a true sporting dynasty. An evocative name for a magnificent bloodline of thoroughbred sports cars. For seven decades the heartbeat of Aston Martin’s purest models, the Vantage nameplate has been worn by some true icons. First used in 1951 on a high-output engine option for the DB2, Vantage was quickly established as a model in its own right. Highlights include the William Towns-designed V8 Vantage, spectacular twin-supercharged V600 Le Mans and the much-loved V8 Vantage. Today this formidable sporting dynasty is poised to hit new heights with the introduction of the new Vantage. 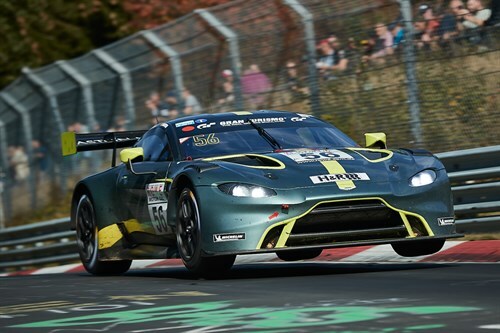 The new Aston Martin Vantage GT308 Oct 2018Running trouble free on the world's toughest race track and finishing fourth overall in Round 8 of the VLN Endurance Championship. 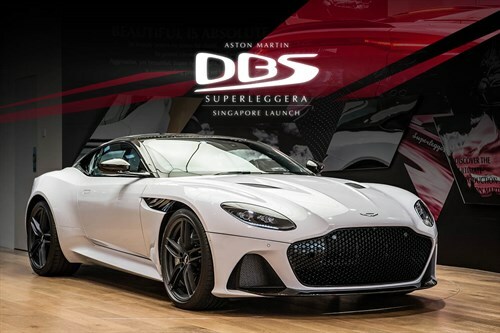 Aston Martin DBS Superleggera - Singapore Launch17 Aug 2018The ultimate Aston makes it's debut on our sunny island. 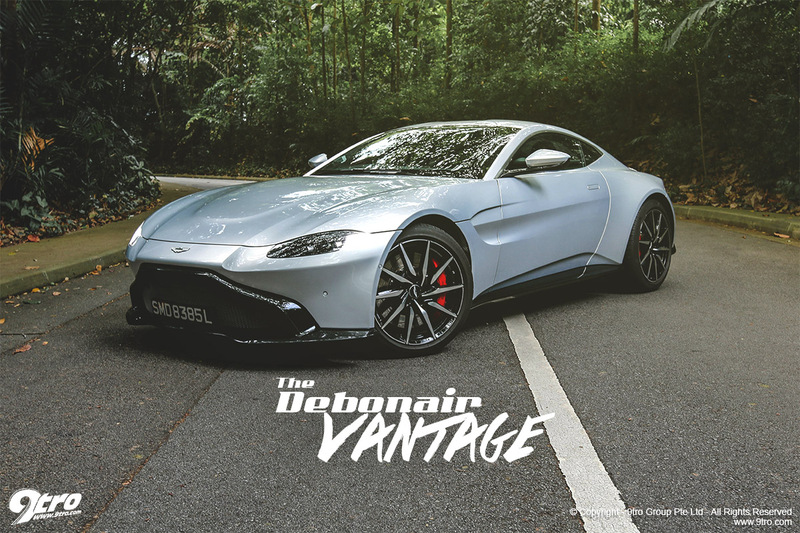 The design story continues inside the Vantage, with a dynamic and focused sports car cockpit that rejects long, fluid curves in favour of sharp, focused lines denoting the more aggressive nature of the car. A high waist interior theme and lower driving position creates a more immersive driving experience, and contributes to significant gains in occupant space and significant improvement in headroom compared with the outgoing Vantage. A combination of rotary and toggle style controls have been used for their tactile and intuitive functionality. Likewise, the PRND transmission buttons have been moved into a triangular formation so as to cluster major controls into clearly defined zones. The interior also offers generous stowage space, with useable room behind the seats and generous double-tier storage areas. The heart of the Vantage is Aston Martin’s potent new alloy, 4-litre twin-turbo V8 engine. Set low and as far back in the chassis as possible for optimal centre-of-gravity and perfect 50:50 weight distribution, this high performance, high efficiency engine returns a CO2 figure of 245g/km yet develops 510PS at 6000rpm and 685Nm from 2000-5000rpm. With a dry weight of 1530kg this gives the Vantage formidable power-to-weight and torque-to-weight ratios - something vividly demonstrated whenever the throttle is squeezed. Detailed tuning of the induction, exhaust and engine management systems has given the Vantage a truly intoxicating character and soundtrack. The Vantage deploys its impressive power and torque to the rear wheels via a rear-mounted ZF eight-speed automatic transmission. Capable of accelerating from 0 to 97km/h in 3.5 seconds and on to a maximum speed of 314km/h, it employs a sophisticated suite of integrated electronic systems to offer maximum control and driver enjoyment. These include Dynamic Stability Control and Dynamic Torque Vectoring. The speed-dependent electric power steering has 2.4 turns lock-to-lock for an outstanding combination of responsiveness and precise, intuitive control. The chassis is an evolution of the latest generation bonded aluminium structure first seen on the DB11, though some 70 percent of the structure’s components are new for Vantage. Balance, strength, rigidity and weight efficiency were all priorities in the new Vantage design, as was handling purity and consistency. Highlights of the chassis include a solidly mounted rear subframe for an enhanced feeling of direct connection for the driver, new Pirelli P Zero tyres developed specifically for new Vantage and the latest generation Adaptive Damping System which incorporates Skyhook technology and offers the choice of Sport, Sport Plus and Track modes. The Vantage features a high level of standard equipment, including keyless start/stop, tyre pressure monitoring system, parking distance display, park assist and front and rear parking sensors. The In-Car Entertainment system - controlled and viewed via a centrally mounted 8-inch LCD screen - comprises of the Aston Martin Audio System, Bluetooth audio and phone streaming, iPod, iPhone and USB playback and an integrated satellite navigation system. Being an Aston Martin, the new Vantage also features a high level of craftsmanship, evidenced by flawless paintwork, luxurious Alcantara and leather upholstery and the levels of finish optimised through the use of tactile natural materials of the highest quality. There is also extensive scope for personalisation via a generous choice of options. These include forged alloy wheels in a variety of finishes, Sports Plus Collection (comprising Sports Plus seats and Sports steering wheel), carbon fibre interior and exterior detailing and a Premium Audio System.